Apprising Ministries has shown you that it’s not uncommon now for contemporary evangelical pastors to openly lavish praise upon WF prosperity preacher Joel Osteen. You can see for yourself in previous posts like Elephant Room 2’s Steven Furtick, James MacDonald, And Joel Osteen and SBC Pastor Ed Young, Jr Pays Homage To Joel Osteen. I tell you the truth, such is the time of timid tolerance in which we live where we’re seeing that even Word Faith Heretics Like Creflo Dollar Draw Nearer To Evangelical Acceptance. 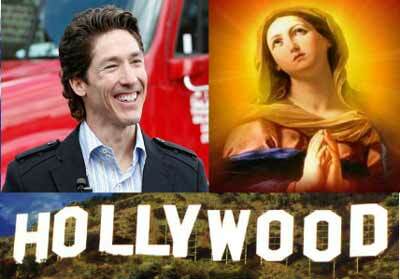 Well, ever the entrepreneur, it seems now that Joel Osteen to Produce Movie About Mary. Megachurch pastor and best-selling author Joel Osteen will produce his first movie, considered the biblical prequel to the story of The Passion of The Christ. The film, entitled, “Mary Mother of Christ,” is going to be released in North America sometime in 2013. “Mary, Mother of Christ” is an upcoming historical film that will retrace the life of Mary from her youth to her struggles as a young mother caring for her child, Jesus, up to the age of four-years-old. Lakewood Church Pastor Joel Osteen will be the executive producer to the film. It will be Osteen’s first foray into film production. “Minister Joel Osteen of Lakewood Church, the most prominent Christian Evangelical minister in the world, has signed on his first movie ever as Executive Producer with a massive marketing and promotion plan,” Aloe Entertainment’s website reads. Well, as a result of this project, I have some good news and some bad news. The bad news is, it seems prophet-pastor Steven Furtick will go ahead with his feature film on the Book of Acts. Perhaps there’s truth to the rumor that Furtick will star as the risen Christ. And the good news is, just maybe, Mary will be in a better mood and won’t hold the Holy Spirit hostage anymore. POPE BENEDICT AND VIRGIN MARY HOLDING UP A SECOND COMING OF THE HOLY SPIRIT?